Universal’s “Battleship” will release on Blu-ray Disc, DVD and Digital Download on August 28, 2012. The The Blu-ray Combo Pack is packed with a DVD, digital copy of the film, and UltraViolet license for storing a copy in the cloud. The digital copy can be used on PCs, iPhones, iPads, and supporting Android devices. “Battleship” exclusives on the Blu-ray include an alternate ending, Universal’s Second Screen, pocket BLU app, BD-Live, and a behind-the-scenes tour with director Peter Berg. 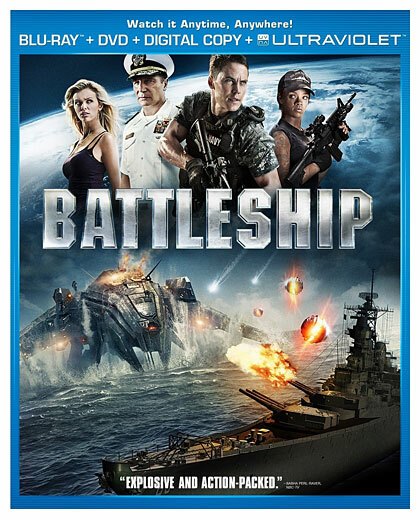 Extras on both the BD and DVD include featurettes “Preparing for Battle,” “All Hands on Deck: The Cast,” and “Engage in Battle.” Battleship stars Liam Neeson, Taylor Kitsch, Rihanna, Alexander Skarsgard & Brooklyn Decker. Amazon has got “Battleship” available to pre-order for $24.99 (List: $34.99). UNIVERSAL CITY, Calif., July 9, 2012 /PRNewswire/ — An exhilarating campaign to save mankind unfolds on the high seas, in the skies and on land when Battleship – the entertaining, action-adventure made with unprecedented support of the US Navy – comes to Blu-ray™ Combo Pack, DVD and On Demand August 28th, 2012, from Universal Studios Home Entertainment. Also available through Digital Download. Against all odds, a daring young naval officer and his heroic crew launch an all-out military showdown against a superior alien force in this enthralling, thrill-ride that will have viewers holding their breath through the final gripping face-off. Blu-ray ‘s high-definition picture and perfect hi-def 5.1 surround sound provide the ultimate showcase to experience the film’s awe-inspiring special effects, non-stop action and ingenious weaponry. Almost two hours of exclusive bonus features including all-new featurettes, behind-the-scenes footage, filmmaker commentary and an exciting pre-visualization of an alternate ending make this a must-own disc for every movie fan. The Blu-ray™ Combo Pack contains a Digital Copy of the film, compatible with iPhone®, iTunes®, iPad®, iPod®, iPod® touch, Android™ and online retailer partners as well as UltraViolet™. UltraViolet™ is the revolutionary new way for consumers to collect movies and TV shows in the cloud to instantly stream and download to computers, tablets and smart-phones. Consumers can now truly enjoy their movies anytime, anywhere on the platform of their choice. Hasbro – makers of the Transformers and G.I. Joe franchises – joins with powerhouse filmmaker Peter Berg (Hancock, The Kingdom, Friday Night Lights) to create this thrilling film inspired by Hasbro’s popular naval combat game, Battleship. The film stars Taylor Kitsch (X-Men Origins: Wolverine, John Carter), Liam Neeson (The Grey, Taken), Alexander Skarsgard (HBO’s “True Blood,” Melancholia), global music superstar Rihanna in her motion-picture debut, Brooklyn Decker (Just Go With It), and Tadanobu Asano (Thor, upcoming 47 Ronin), with a supporting cast that includes Hamish Linklater (Fantastic Four), Jesse Plemons (NBC’s “Friday Night Lights”), and in his professional acting debut, U.S. Army Colonel Gregory D. Gadson, a battalion leader who lost both legs in Iraq in 2007. The Visual Effects of Battleship – From ground-breaking water-simulation programs to cutting-edge motion capture, see how the team at Industrial Light & Magic pushes the boundaries of visual effects to bring the aliens to life. All Access with Director Peter Berg – Join director Peter Berg as he gives fans an in-depth, behind-the-scenes look at the making of the movie. USS Missouri VIP Tour – Come aboard the historic “Mighty Mo” for an exclusive tour with director Peter Berg and actual Navy veterans as they reveal some of the coolest facts and amazing action that has graced the decks of this legendary ship. Commander Pete – Watch as director Peter Berg energizes the cast and crew with his endless enthusiasm and relentless good humor. Preparing for Battle – Hear how Hollywood teamed up with the US Navy to transform a beloved board game into a big-screen blockbuster. All Hands on Deck: The Cast – Witness the actors getting into the military mindset and Navy veterans having their time in the spotlight in this salute to the people at the heart of the story. Peter Berg (Hancock, The Kingdom, “Friday Night Lights”) directs and produces Battleship, the epic-scale action-adventure that James Rocchi, MSN Movies calls, “A big, bold blast! Packed with brains and heart, and explosively fun.” Taylor Kitsch plays Lieutenant Alex Hopper, a naval weapons officer assigned to destroyer USS John Paul, and humanity’s last hope in the face of a global alien invasion. Alexander Skarsgard (“True Blood,” Melancholia) is Hopper’s older brother, Stone, Commanding Officer of USS Sampson; global music superstar Rihanna makes her motion-picture debut as Petty Officer Second Class Cora Raikes, Hopper’s crewmate and a weapons specialist on USS John Paul Jones; Brooklyn Decker (Just Go With It) is Sam Shane, Hopper’s fiancee and a physical therapist specializing in the rehabilitation of military combat veterans; Tadanobu Asano (Thor), is Captain Yugi Nagata, commanding officer of the Japanese destroyer Myoko and Hopper’s archrival; and Academy Award® nominee Liam Neeson (The Grey, Taken) plays Hopper and Stone’s superior (and Sam’s father), Admiral Shane, Commander of the Pacific Fleet.